The bar downstairs was noisy, but what do you expect on a Friday night? The room was cosy enough, as was the little double bed that seemed tiny compared to the King sized one we had slept on the night before. The bathroom was clean, though the water stream wasn't the strongest. 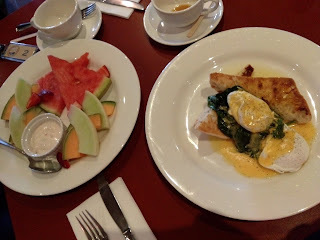 The best thing about Customs House Hotel is the location - close to Daci & Daci Bakers, the waterfront, and Salamanca place - and the complementary breakfast they offer. One meal from the menu and bottomless tea and coffee.